Sirius Day Spa Franchising LLC. is continuing its aggressive expansion across the US with an additional 5 new Sirius Day Spa locations set to open in Florida, Georgia, Arizona and Minnesota in 2018. Sirius Day Spa Franchising LLC. is continuing its aggressive expansion across the US with an additional 5 new Sirius Day Spa locations set to open in Florida, Georgia, Arizona and Minnesota in 2018. This comes on the heels of the recent Frisco, Texas and Lakewood Ranch, Florida openings. 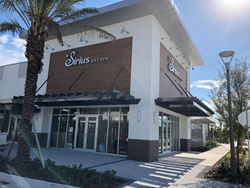 This will bring the number of Sirius Day Spa open locations to 8 since its inception earlier this year, with a total of 343 projected locations opening over the next four years. Ten additional spas are currently in development stages with opening dates scheduled in early 2019. This impressive growth and interest in Sirius Day Spa’s franchise concept is closely aligned with beauty industry trends. According to the latest International Spa Association (ISPA) U.S. Spa Industry Study, the total number of spa visits surpassed 180 million for the first-time last year an increase of 2.5 percent overall since 2015. Income also set a new annual record of $16.8 billion, a jump of 3.1 percent. An innovative and unique franchise concept, Sirius Day Spa offers more than 40 luxurious spa, aesthetic and wellness options under one roof with a convenient, cost-effective monthly membership program for customers. This go-to beauty destination offers state-of-the-art treatments - customized by professionals to meet the needs of their individual clients - including facials, massages, body wraps, nail services, teeth whitening, hair blow-outs and so much more. Each client experience is tailored for guests with the goal of providing revitalization, relaxation, and essential beauty services administered by highly trained, licensed professionals in a luxurious setting. The Sirius Day Spa membership model and privileges can be applied to any service, in any Sirius Day Spa location nationwide, making the whole experience affordable and convenient for consumers. Sirius Day Spa is operated by The Leonesio Group (TLG-SDS, LLC) who uses John Leonesio's franchise formula to create successful, rapidly growing brands. This franchise formula was the same used at Massage Envy, The Joint, and other successful franchises developed by Mr. Leonesio, a name synonymous with successful Health, Wellness and Beauty franchises.